The key to a successful loan workout is to identify the problemsaccurately and address them early. It is critical that thecompany's underlying business and financial problems are resolvedand not merely the symptoms. 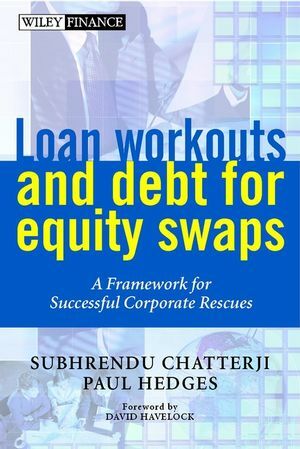 Loan Workouts and Debt for Equity Swaps examines how a successfulloan workout can be managed. It detail the processes andparticipants involved, whilst providing frameworks and practicalstep- by-step approaches that allow for a coherent and cohesivepolicy to give the best possible chance of success. The bookassists in the ultimate aim of providing a firm base for the futurehealth of the company involved and maximizing the lenders' returns.This work is not merely restricted to companies and banks involvedin the process, but other important participants in loanworkouts. SUBHRENDU CHATTERJI has worked with banks and corporate clients on loan workouts and corporate restructurings around the world. In addition to advising on loan workouts-related strategy, systems and structures within banks, he specialises in structuring debt for equity swap transactions. He is currently the Chief Executive of ConsultingBase, an exchange for consultants working in the emerging markets and developing countries. PAUL HEDGES is a Senior Manager with the Royal Bank of Scotland. Since 1989, he has been involved in the credit risk and debt workout areas, both in the UK and Eastern Europe. Paul is particularly experienced in the restructuring of the debt of large, multinational companies, and in multi-bank transactions. He has participated in complex financial restructurings, both as a banker and as a consultant to banks and comapnies. Foreword by David Wilson Havelock. Loan Workouts: What They are and Why They are Needed. STRATEGY, PARTIES AND THE PROCESS. A Framework for Managing Non-Performing Loans. Organisation and Systems Relating to Non-Performing Loans. Other Key Participants in Loan Workouts. A Framework for Executing Loan Workouts. The Information Gathering and Review Process. Evaluating Restructuring Options and Developing Proposals. THE MORATORIUM AND FINANCIAL RESTRUCTURING. The Operation of Facilities in a Moratorium. Inter-Creditor Provisions in a Financial Restructuring. Introduction to Debt for Equity Swaps.